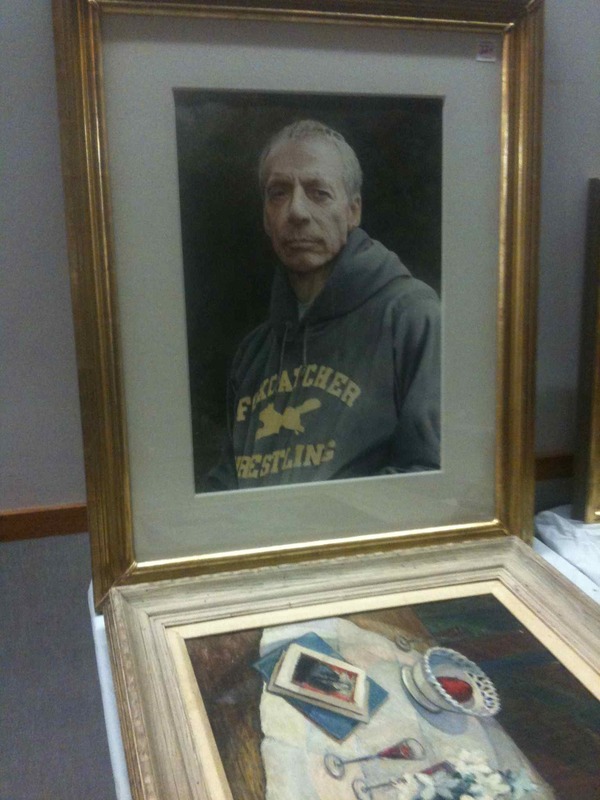 John du Pont’s official portrait in Foxcatcher sweats on display at his estate sale in 2011 for which he paid artist Hubert Shuptrine $100,000. Delaware County, Pa. on Feb. 22 has a better than even chance of making another Oscar appearance — Jennifer Lawrence won Best Actress for 2012 for Silver Linings Playbook — as Foxcatcher was a finalist for the Palme d’Or at the recently ended Cannes Film Festival. The prize went to Winter Sleep, a Turkish film about class struggle (or something) in that country. Don’t expect it to compete for Best Picture. Foxcatcher concerns the Jan. 26, 1996 murder of Olympic gold medal wrestler Dave Shultz by John du Pont at du Pont’s Foxcatcher estate and training facility in Newtown Township. It’s based on the autobiography of Shultz’s brother Mark, who was also an Olympic gold medalist that trained at the estate. I knew du Pont. I even have an autographed copy of his book Off The Mat, which was clearly created by an abjectly bored ghost writer granted unwise access to a list of cliches. He was nuts. You would never believe his answering machine. I did not know Shultz who had a reputation of being a decent family man who sent his kids to the local public school, Culbertson. 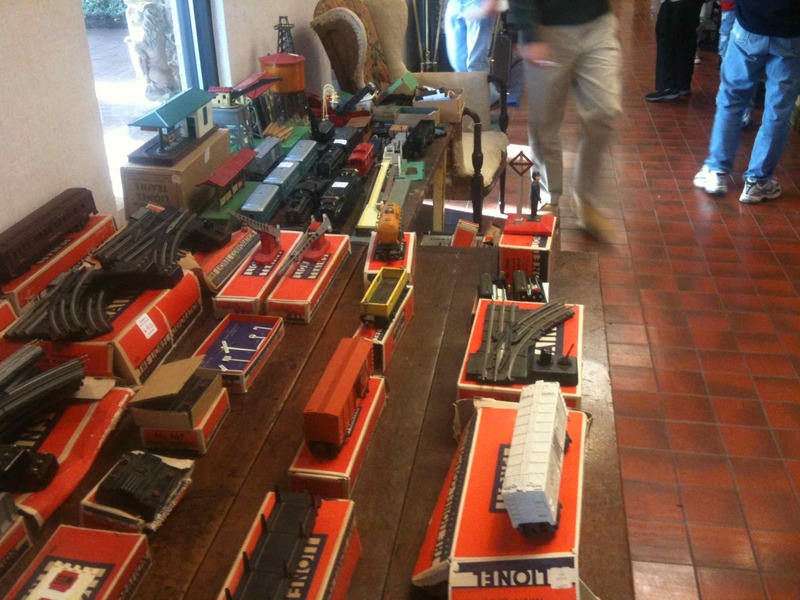 The electric trains with which John duPont played while a lonely boy in a large, fatherless home with a coddling mother are among the items from his estate which are being auctioned tomorrow, Nov. 26, in Ludwig’s Corner, Pa.
DuPont, the richest man to ever be convicted of murder for the 1996 killing of Olympic gold medal wrestler Dave Schultz, died Dec. 9 in minimum-security state prison in Mercer. He had grown up and lived in Newtown Township, Delaware County. In the 1980s, duPont was on the lists of the magazine rankings of the richest Americans, and presidents were hosted at his home. This portrait of duPont in garb of the Foxcatcher wrestling program which he ran at his Newtown estate and which led to his ultimate downfall is expected to bring between $500 and $700. Auctioneer Ted Wiedersiem says duPont paid artist Hubert Shuptrine $100,000 to have it done. John Eleuthère du Pont was pronounced dead at 6:55 morning, Dec. 9, at Somerset (Pa) Community Hospital. where he had been taken after being found unresponsive in his prison cell at Laurel Highlands State Prison nearby. He was 72. Authorities say he appears to have died of natural causes. Du Pont, an heir to the du Pont chemical fortune and who appeared on magazine lists of America’s richest people, was convicted of 3rd degree murder for the Jan. 26, 1996 shooting of Olympic gold medal wrestler Dave Schultz at Foxcatcher Farms which was duPont’s Newtown Square estate. Third degree murder indicates the lack of intent to kill, and the jury also found him mentally ill. Defense experts testified he had been a paranoid schizophrenic who believed Schultz was part of an international conspiracy to kill him. He was arrested after a two-day siege at his mansion which was featured on news broadcasts throughout the world. Police took him into custody when he left the house to check on a generator the police had shut off. Judge Patricia Jenkins sentenced him to 13 to 30 years in State Prison. He was denied parole the first time he became eligible on Jan. 29, 2009. He is said to be the richest man ever to be convicted of murder in America. Du Pont was an athlete, a helicopter pilot who assisted local police, and had a Ph.d in natural science from the University of Villanova. The university’s basketball stadium, The Pavilion, was named The Du Pont Pavilion until his conviction. He was also Villanova’s wrestling coach for a time. He founded the Delaware Museum of Natural History in 1957 which opened to the public in 1972. He was married in 1983 but the marriage lasted only 90 days and was annulled amid allegations of abuse. Du Pont’s 1987 self-published book “Off The Mat” features photos of himself with presidents Ronald Reagan and Gerald Ford, and Olympic great Mark Spitz. There is a picture of himself lying in a snowy field with a sniper rifle which describes him as a “dedicated public servant and volunteer law enforcement officer” joining “in a winter midnight manhunt”. After his mother Jean Liseter Austin du Pont died in 1988, du Pont became more erratic. The editor of the local weekly remembers receiving a phone call from him crying and asking why the obituary had not been published. He began calling himself the Dalai Lama dressing in a long, red robe. He lost his coaching slot at Villanova after wrestlers began objecting to his behavior. A lawsuit was filed by an assistant coach alleging he had been fired because he spurned a request from du Pont to be his lover. Finally, one January day he approached Dave Schultz who was working on his car at a guest house on the estate. Schultz looked up and said “hi coach” and du Pont shot him three times killing him. Du Pont’s Foxcatcher Farms estate has been broken up for development. Much of it is now the new home of the storied Episcopal Academy .